We were lucky enough to get to fly out to Las Vegas this summer for a few days with family. It was my uncle's 90th birthday, and a lot of us joined him to celebrate in his favorite way. Weirdly, Vegas is kind of perfect for a wholesome family vacation. There's something for all ages and tastes, and it's easy for people to go their own way or be all together in a large group. The variety in activities is huge. I fell swiftly into the nerdiest segment of cousins (you must be shocked): the one that did minimal casino time and maximized educational-ish field trips. One of the coolest things we did was drive out to Seven Magic Mountains. 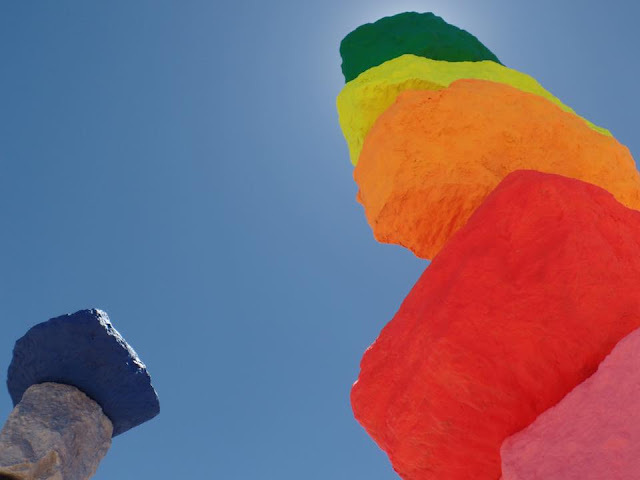 Seven Magic Mountains is a two-year public art installation by Swiss artist Ugo Rondinone. It took five years to build the sculptures of stacked locally-sourced boulders. It's visible from quite far away, and is an incredible burst of color in the middle of the desert. These photos are unedited from my iPhone. I can't recommend this field trip enough!